MOWI 1050 is a completely new design. 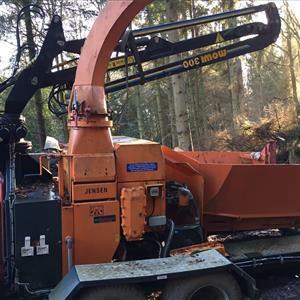 It is designed for intensive use in thinning and final felling. A big wagon for both the professional as the self-forest owner who does most of the forest by himself. Can also be used to resolve all common lifting and transportation needs on the farm and in other activities. In terms of function and performance is rig in the higher class. MOWI's articulation and engineered skogsboggi sitting on a powerful new complete bakvagn.Tre banks is standard with rear light well protected, built-in rear bank. Telescopic support legs as an option. Load capacity is 10 tons, load area 2.3 sqm. Default is 15/70x18-hjul, wheel options 400/60x15 0.5 wheels. MOWI 1050 is standard equipped with MOWI P30, a newly developed model with a range of 5.7 meters and lift 450 kg at full length or with MOWI's famous 400 model with a reach of 6.2 meters and lifting power of 480 kg. Both models have unique MOWI advantages: easy to drive, high accessibility, stable and secure. Moreover, with good movement patterns and parking.